Certain places around Major League Baseball have been around since the birth of the league. Due to that fact, the history of those particular cities is deep. Thousands of people have been a part of the ran and file of that team, and helped create some amazing memories for their fans. The Cincinnati Reds have pretty much been around since day one, and contributed some defining moments to the game of baseball. 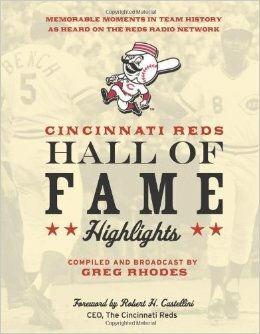 Today’s book takes a look at some of those incredible moments in Reds team history. When you have been in existence since 1869, where do you even start to define your greatest moments? Just by the sheer number of years you have been around you have more possible moments than everybody else. When you think about it the Cincinnati Reds have been around since almost the end of the Civil War. They are approaching 150 years in the league and are still on a daily basis making memories. Greg Rhodes has compiled a book that was a monumental undertaking in my opinion. There are so many great moments over that near century and a half, that it has to be hard to narrow it down to just one book. The author breaks the book down into twenty year chapters. The initial chapter of the book covers the early years, 1866-1879 and then works in twenty year increments after that. Every section covers the who, what, when and why questions that have arisen in Reds history. It reviews the personalities that have graced the Reds, as well as major achievements on the field on both an individual and team level. It gives a good perspective of what the Reds have accomplished throughout their history. If you are not Cincinnati Reds fan, or from that area, this book gives a good look at team history and player accomplishments. Many team books out on the market focus on one genre, and let some events or people fall through the cracks. This books make sure that the people and events that helped shape the team are not forgotten. You see names like Bucky Walters, Hugh Kritz and Clyde Shoun. While not Hall of Famers outside of Cincinnati, they have made big contributions to the team’s legacy. This book gives them their due and makes sure they don’t get lost in the passage of time. I think books like these are important to fans. They are a nicely presented history lesson for the reader, and it makes sure that the people who contributed to the teams history are never forgotten. For other fans it may prove the Reds actually did exist before the birth of the Big Red Machine. All fans that enjoy reading about history should read this book. It is very thorough in its team history from the beginning of the team, to its published date of 2007. It is presented so well, you won’t even realize you are learning something. Coffee Table History Books – the caliber of which will make team fans proud !!!! !